The findings of the human skeletons from the past is indeed common. However, what if the skeletons were found was a pair of lovers and is found in the position of the hand in hand? It's like finding the skeleton of Romeo and Juliet. Archaeologists from Cluj-Napoca Institute of Archaeology and History of Art finds with these characteristics. He found it after doing the digging at the site of the former Dominican monastery. Principal researcher in these excavations, Adrian Rusu, said, "it's a mystery. Burial of sorts that's rare in the past. We believe that the man who discovered that skeletal dead because of injuries to the pelvis is broken. " 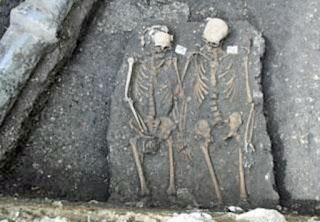 Because the female skeletons found show that the woman was in a healthy condition, then the Rusu and his team suspect that the women died of heartbreak due to abandoned his partner. It is unclear how the women found skeletal died. However, since suicide is considered a sin at that time, it is likely that the woman committed suicide. If indeed the woman did, then his body was not buried with a position like when found. "They must have been buried together as a tribute will be the love they have," said Rusu was quoted as saying the Daily Mail, Monday (22/4/2013). The two frameworks are expected to come from the year 1450-1550. Another skeleton found, but allegedly not connected with two frame it.